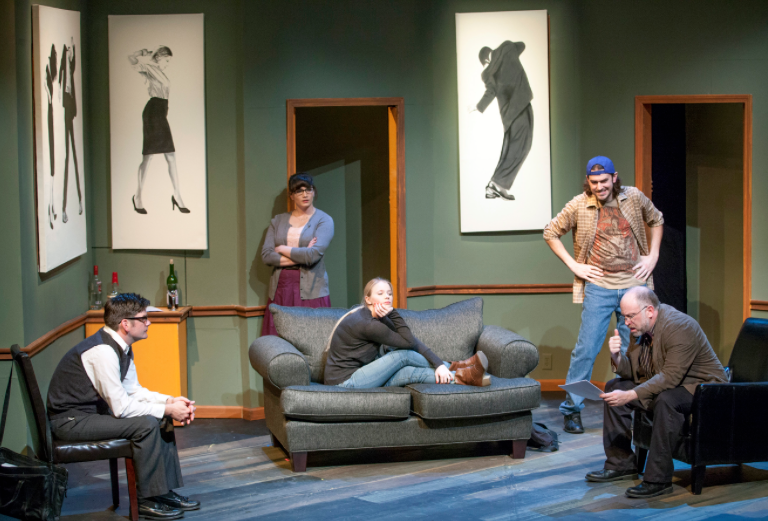 Egos clash as five vibrant but very different personalities explode on the St. Louis Actors’ Studio stage as Season Nine opens with a fiery script from Theresa Rebeck. Four aspiring writers sign up for a private seminar with a noted novelist. They’ve been warned that his approach is somewhat unorthodox and it doesn’t take long for egos to be bruised and bad behavior to surface- from all five characters. Though all of them are petty and disagreeable in their own ways, the wonderful actors and brilliant direction guide this script into a “must see” production. 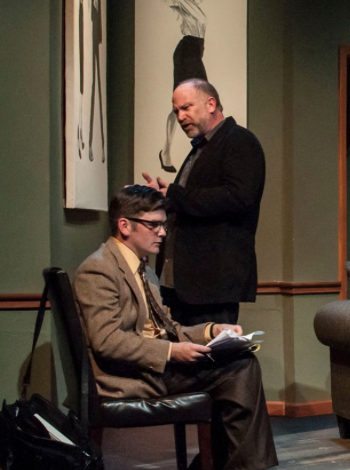 Jason Contini and John Pierson confront each other in “Seminar” at St. Louis Actors’ Studio. That brilliant direction is the result of veteran Elizabeth Helman. She squeezes likability out of people you wouldn’t want to spend five minutes with let alone week after week of whining, complaining and backbiting. The actors make their characters interesting and that’s the key to overcoming discontent with them- even eventually admiring them for one reason or another. Leonard, the literary lion who leads the group, is given a bitter-edged performance by John Pierson. He assaults all of them, damning them with faint praise while dashing their hopes and dreams. Some have tough skin, others don’t. Pierson’s calculated barbs are a sheer delight and we begin to like him despite his zealous poison pen approach to their work. As the play opens, we are treated to a pompous story from Douglas about his time at the Saratoga Springs writer’s colony, Yaddo. He gushes about the surroundings in shimmering platitudes as he tries to impress Izzy- the young and beautiful girl he’s infatuated with in the group. Describing the buildings as floating in this ethereal setting, he comes off as a horse’s patoot. But Douglas comes from a literary family and he already has several publications interested in his work including the New Yorker. Nathan Bush (seated) endures the wrath of John Pierson in “Seminar” at STLAS. 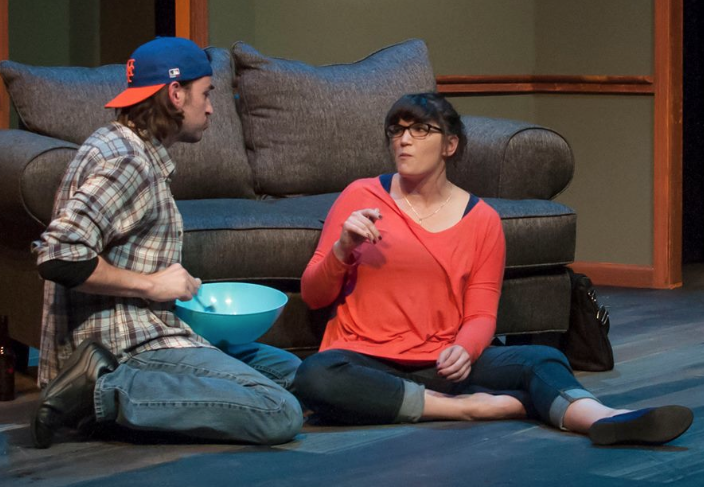 Jason Contini and Taylor Pietz discuss writing and relationships during “Seminar” at St. Louis Actors’ Studio. Taylor Pietz, as Kate, gets the brunt of his blows as Leonard shoots her out of the water, dismissing her work as juvenile tripe. She gets back at him- and the rest of the seminar participants- with a literary trick that surprises us all. Her vulnerability seems to take the form of appearing to not give a damn if she is a success as a writer or not. Jason Contini rounds out the “Seminar” cast as the moody and unpredictable Martin. Reticent at first, we finally hear the appraisal of his work in the second act and it sparks an unexpected firestorm that brings secrets and lies to the forefront that affects all of them. 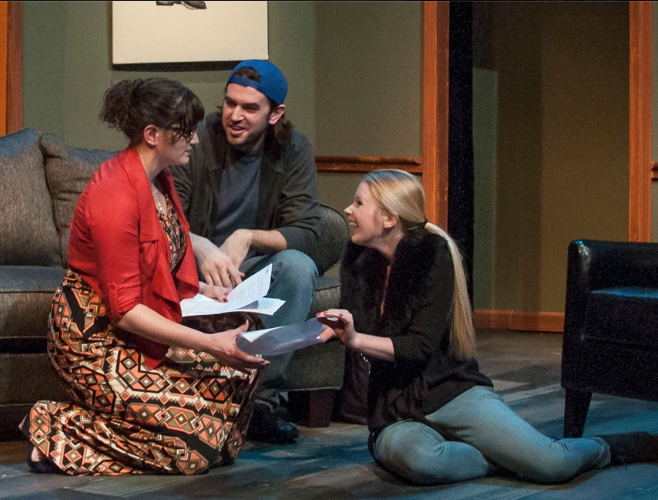 Theresa Rebeck’s script is a solid one but it feels that it wouldn’t be as effective without a capable cast. The characters are at times too trite and full of themselves. Thanks to director Elizabeth Helman and her fine cast, it becomes a great way to spend a couple of hours in the theatre. Add the spare but effective set of Patrick Huber, enhanced by the dominating quartet of stark paintings, it has the feel of a literary seminar and, of course, when we find out that Kate’s family owns this Upper West Side Manhattan apartment for the rent controlled price of $800 a month, it almost turns this story into a fantasy (like something Douglas might tell to a wide-eyed young girl he’s trying to impress). 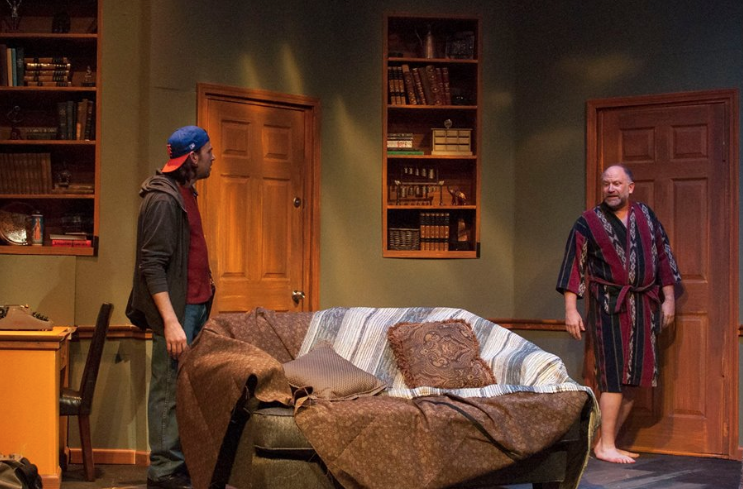 Excellent work from the rest of the crew including the Patrick Huber lighting design, the costumes of Carla Landis Evans and Elizabeth Helman’s sound design. 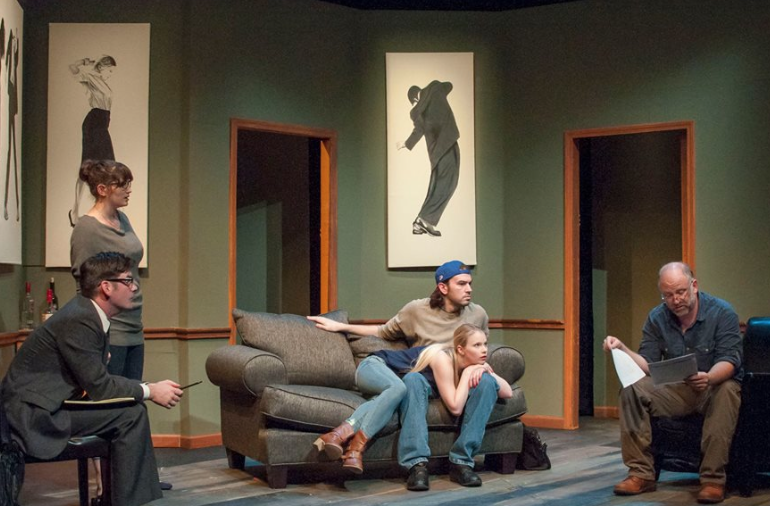 It’s odd how a play that isn’t that profound can have a lasting effect thanks to a wonderfully crafted production. 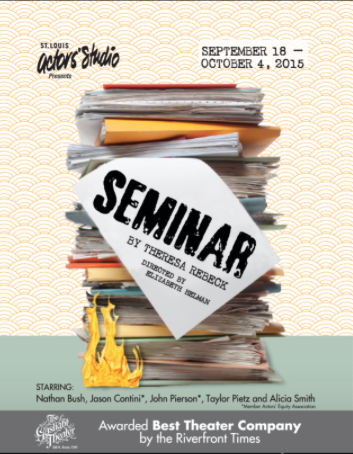 “Seminar” plays at the St. Louis Actors’ Studio at the Gaslight Theatre through October 4th. Contact them at http://www.stlas.org for tickets or more information. This entry was posted on September 23, 2015 at 9:43 pm09 and is filed under Uncategorized. You can follow any responses to this entry through the RSS 2.0 feed. You can leave a response, or trackback from your own site.